Just two weeks on from the gruelling challenge of the Hastings Half Marathon, 20 Hastings Runners took on another 13.1-mile course at Paddock Wood. With cooler conditions and fewer hills, the results were superb with no fewer than 11 of the runners recording a half marathon personal best. Leo Cacciatore was the first Hastings Runner across the line in a time of 1:21:56, narrowly missing out on a place in the top 100 of a very strong field. Debbie Humbles was the first female in a personal best time of 1:40:24. 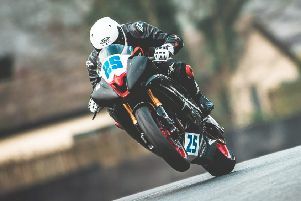 There were also PBs for Graeme Grass, Todd Fitz-Hugh, Michael Grass, Michael Hamer, Kevin Blowers, Ashley Ballard, Elly Swaine, Simon Linklater, Sarah Holmes, and Lorraine Ashby. The finish line was most certainly a happy place on Sunday. Results: Leo Cacciatore 1:21:56, Graeme Grass 1:33:50, Todd Fitz-Hugh 1:39:38, Debbie Humbles 1:40:24, Michael Grass 1:40:58, Michael Hamer 1:41:36, Dean Fox 1:42:00, Kevin Blowers 1:43:50, Richard Cross 1:44:12, Ashley Ballard 1:52:58, Shaun Ballard 1:55:56, Marie Appleton 1:57:35, Adrian Battatt 1:58:53, Elly Swaine 1:59:04, Simon Linklater 1:59:38, Sharon Wadham 2:02:52, Sarah Holmes 2:02:55, Julian Buss 2:19:39, Lorraine Ashby 2:23:10, Natasha Slow 2:32:54. 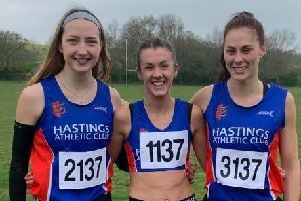 A few Hastings Runners also took on the Kent Spring Half Marathon, with Sarah Bendle and Sarah Marzaioli both coming first in their respective age categories. Andy Lee wanted more of a challenge and took on his first ever marathon, clocking an amazing time of 3:32:24. Not only was it good enough for first place in his age bracket, but the time also secured him a spot in next year’s London Marathon. Results - Half Marathon: Sarah Bendle 1:45:41, Nigel Thornley 1:58:02, Sarah Marzaioli 2:08:23. Marathon: Andy Lee 3:32:24.